Josh McKay, owner and operator of McKay Landscape, knows the value of a beautiful home. Since 2000, he has been leading a small team of certified horticulturalists, landscapers and greenskeepers in creating relaxing outdoor spaces for discerning homeowners in Orillia, Barrie and Muskoka, Ontario. 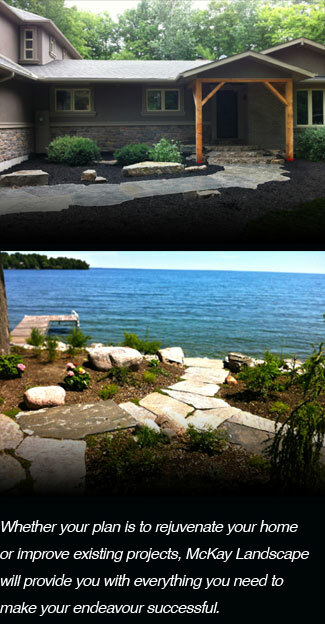 McKay Landscape values efficiency, professionalism and client satisfaction above all else. Only using the highest quality materials, our landscaping projects create a beautiful outdoor oasis that will last for generations. We use only top-of-the-line tools including our skid steers, excavator, dump truck and float, which we put to use as we create your beautiful outdoor landscape. Uniquely, McKay Landscape also offers clients access to our stockyard so you can receive quality landscaping materials at an affordable price. We offer additional topsoil, mulch, river rock, granular materials and natural stone for any extra projects you may choose to complete. Every client of McKay Landscaping will enjoy a design consultation with Josh McKay, where our own owner and operator will work alongside you to create a design with materials to fit your needs. Josh believes that a hands-on approach is essential to maintaining our excellent customer service, and ensures that every project is adhering to the top quality standards McKay promises. The result is a beautiful landscape which improves the look of every home we take part in shaping.